I’m stepping away from my usual home decor talk to share something that’s been a big part of my life for the past two years. A long time ago, when I was young (ha!) and in school, I was super active. I played competitive basketball most of the year, volleyball, and even did a stint with track. Exercising was a HUGE part of my life because of sports. As I’ve gotten older, my fitness journey has looked very different depending on the season of life that I’ve been in. Some seasons, the question would be “what is a fitness journey?” and other seasons, I’d consider heading to the gym twice a week to be my exercise regimen. Today, I want to talk more about my fitness journey and what I’m doing with core strengthening exercises to help with my low back pain. I hope you are interested in more than the “home decor type stuff” but, if it’s not your thing… it’s ok! I’ll be back to home decor stuff later this week. Photographs of myself doing exercises is the MOST embarrassing thing that I’ve ever posted for my blog. ha! About five years ago, I was probably at the best shape that I’ve been in, ever. I was going to the gym three times per week and also doing the Beach Body program by Kayla Itsines. I can’t remember the exact details but I know I was pretty strong in working out spring through summer (hello swimsuit season) and then probably got pretty darn lazy fall (Football season, I’m looking at you). Fast forward another few months, and I wasn’t doing anything consistently at all. I’d say that I’m still a decently active person and maintain a healthy weight but I wasn’t sticking to any fitness goals or plan. We might do a family walk here or there or I might go walk around our neighborhood listening to a podcast but that was it. So, about three years ago… I had my first episode with low back pain and the agonies of that. It’s probably hard to relate unless you’ve been through it, but I’ll try to describe. I was bending down to get a sheet of bacon out of the oven and, all of a sudden, there was shooting pain down my leg and in my low back. It was absolutely horrible. Fast-forward a week and after working with my primary care physician and trying to figure out what was wrong, I decided to try Chiropractic care. I’d never use a chiropractor before but I’d also never had low back pain before and it was intense. I followed all the recommendations from my chiropractor and eventually, about three weeks later, I was back to normal. Then, I stopped going to the chiropractor because they are expensive and I didn’t need to go (or so I thought). Well, another three months later… the back pain started again and it was worse with tingling down my legs. This time around, I did better with following the sciatica pain treatment plan but didn’t adhere 100%. For my low back pain, they determined the the reason it was happening was because my core doesn’t engage day-t0-day. I did quite a few tests for them to watch me and get to this conclusion. My core, because it doesn’t engage, isn’t strong enough to support my activities. So, after working with the treatment plan for about six weeks, I knew what to do… I had a list of core strengthening exercises to help with my low back pain and I was going to keep doing them. Well, let’s just say 3x is the the charm because it took one more low back pain episode for me to be fully committed. I’m a slow learner, can you tell? You might think that these “epsiodes” were sparked by heavy lifting or something crazy, but they weren’t. They came on randomly with things like going up the stairs or sitting down on the couch. I could never pinpoint anything that would cause the problem. So, after going back to the chiropractor and doing the whole treatment plan after the third episode, I really was committed and, so far… it has WORKED for me. So, let me share exactly what I’ve done, how often I do the core strengthening exercises for my low back and what the next steps in my fitness journey are. So, when I got back to “normal” after the third incident (early 2017), I committed to working on my core strength, stretching and regular readjustment appointments with my chiropractor (1x per month). My chiropractor gave me a lists of exercises to do “as many times” a week as I could do them. At my best, I probably did them four times per week. I found a few different online sources for the core strength exercises that you guys might want to check out. Mayo Clinic – I still can’t do the twisting core exercises but I do quite a few of these. Princeton University – Lumbar and Core Strength (this one also includes flexibility and how often to do that versus the core strengthening). Lumbar Stabilization Video – This video is a bit dry but really explains good technique. I’d say, overall, that I did those exercises about 3x per week last year but combined them with yoga. My goal was to do yoga 5x per week. I didn’t hit the goal every week but I did try to stretch if I didn’t do a yoga video. 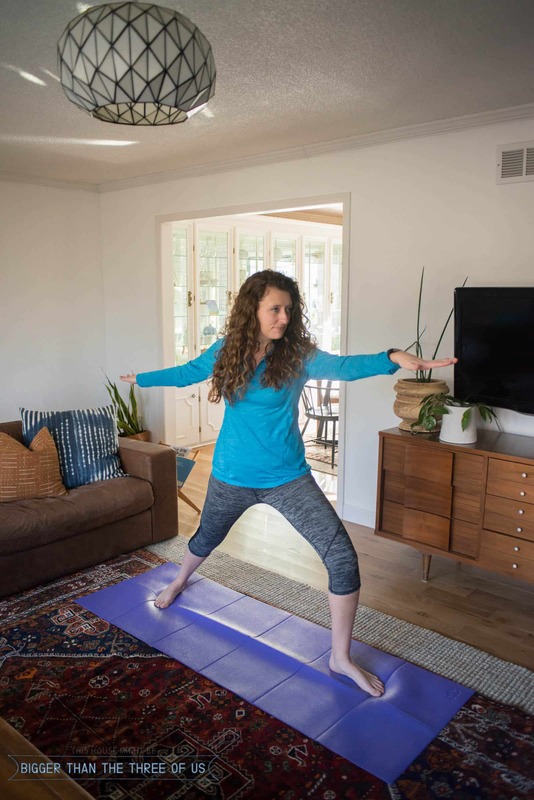 So, for yoga… I do it from home. I really love Sarah Beth Yoga on YouTube. She has lots of videos from five minutes to an hour with all types of levels and areas that she focuses on. I typically do twenty minutes but have tried all of the videos in the list below and really like them. By the end of summer last year, I was actively taking care of my muscles and strengthening my core. I was ready for something else. My son, Greyson, swims on a swim team 3-4x per week and so I’m at the gym during his practice times. I decided to be more active during his practices and start walking. I got a new Fitbit (my old one broke) and started really trying to get steps in daily. I’m not talking about 10 miles or anything, my goal was 7.5K steps. If you live in a walkable city, that amount may seem crazy small but we drive everywhere so I actually have to work at it to get 7.5K per day. Late 2017, I would run a bit at the gym but I wasn’t going crazy. I started doing some light core workouts as well. I’d still have twinges in my back or tightness in my glutes but it was so much better than before. So, I kept it up. And, at the start of this year, I started a new step in my journey. I started back on the Kayla Itsines program. I’m doing things “my way” though and am very careful but I’ve started and it’s going well. Since, I’ve been investing so much in my health, and really it’s something we all should be doing, I thought I’d just share my story and see if it resonated with any of you. I’m just a normal person trying to be healthier, live healthier and enjoy life. We don’t have a fancy gym membership nor do we have a home gym (although, that is a goal!) so it’s mainly me, and the space in my living room… trying to be healthier and take care of my body.